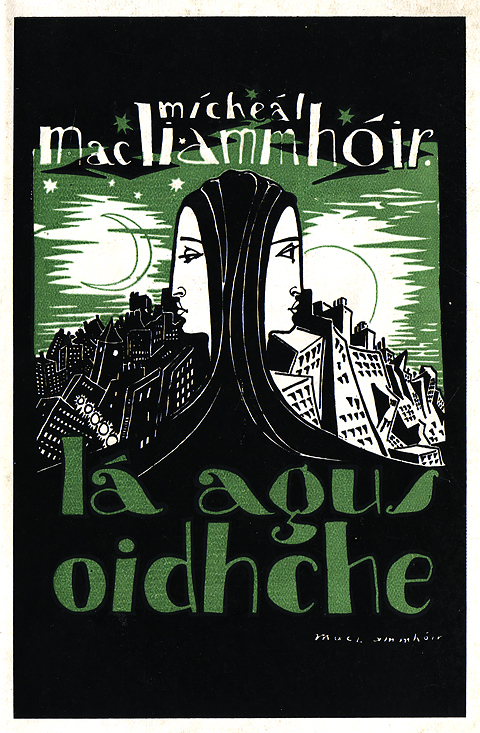 Lá agus Oidhche, Micheál MacLiammóir, An Gúm (1929). Jacket design by Micheál MacLiammóir. 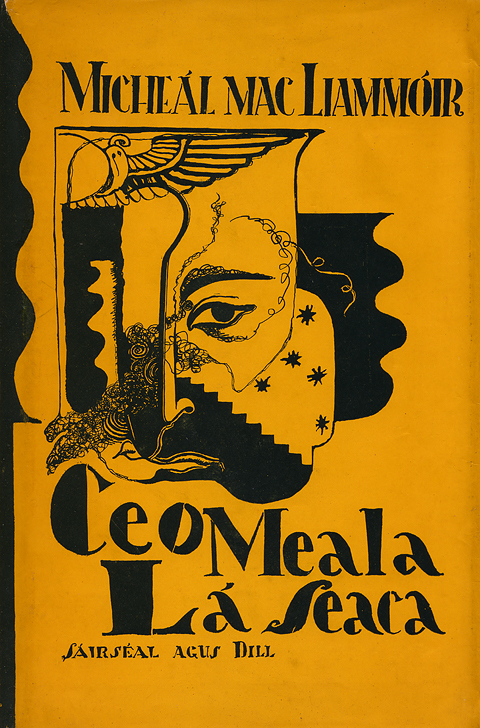 Ceo Meala Lá Seaca, Micheál MacLiammóir, Sáirséal 7 Dill (1952). 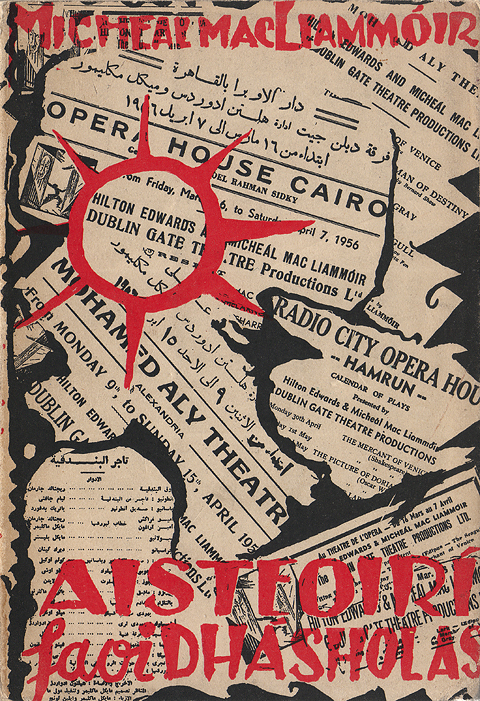 Jacket design by Micheál MacLiammóir. Aisteoirí Faoi Dhá Sholas, Micheál MacLiammóir, Sáirséal 7 Dill (1956). Cover design Micheál MacLiammóir. As a designer Micheál MacLiammóir (1899-1978) is best known for his stage sets and costume designs for the Gate Theatre, which he founded in 1928 with Hilton Edwards. He also worked as an illustrator providing designs for magazines and books. Above are examples of three jackets which he designed for his own books. The jacket of Lá agus Oidhche from 1929 is masterful and as good an example of book cover design as you are likely to find from the 1920s. The playful illustration of the title (Day and Night) shows the influence of Aubrey Beardsley albeit with cruder rendering. In fact, it is this rougher line which makes it much less of a period piece. The other two examples are from the 1950s and don’t have the same inpact as Lá agus Oidhche. Indeed, it is hard to believe that the cover of Aisteoirí Faoi Dhá Sholas is from the same hand. As part of Culture Night this Friday, I am putting together an exhibition of Irish book cover design from the late 20s up until the 1970s. It will include a lot of covers which I have yet to feature on the blog. It will take place in Mary’s Abbey, Meetinghouse Lane, off Capel Street from 6-9pm. If you are in the Capel Street area on friday night please drop in. There will also be a projection of photographs entitled “Life thru my mobile phone” and music by Barry McCormack from 8.30.